Could your deal-stacking skills help you save $28,000 — in just two years? This British mom is our new extreme couponing role model. Twenty-six-year-old mother of two Kez Richards starts her day with an hour of online coupon hunting, The Daily Mail noted in a profile on the savvy shopper. After two years of practice, she says she’s brought down her weekly grocery bill from about $210 for her family of four to about $50 — a savings of more than 75%! She’s saved about 20,000 pounds (about $28,000) in just two years. Richards admits saving money isn’t always glamorous. “I even check supermarket car parks for discarded receipts in case they have vouchers,” she told The Daily Mail. She even picks up receipts she finds to save a few extra cents at the register. 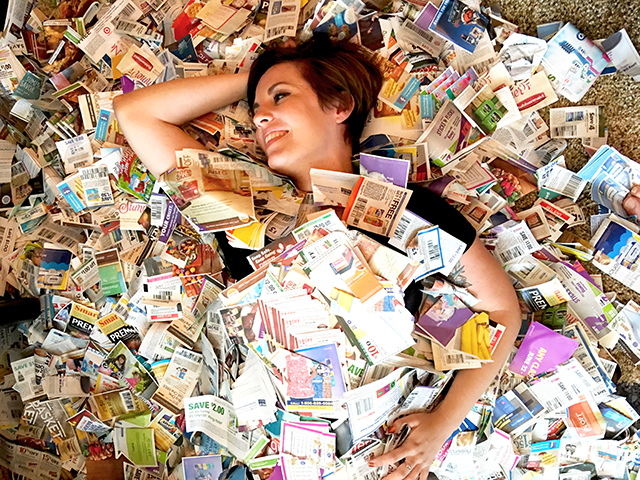 The couponer has learned so much since her early days of absorbing tips from Extreme Couponing on TLC, she’s launched a blog to teach others how it’s done. Now Coupon Mama UK is Richards’ full-time job. We reached out to Richards to learn more about how she’s conquered the world of couponing and her best tips if you’re just getting started. Richards admits her biggest mistake in learning how to save more with coupons came down to knowing the rules, but not being able to prove it. Several times, cashiers have balked at her coupon collection, even when Richards has followed the fine print. “The best thing to do is to print off the store coupon policy and take it with you to avoid being turned away,” she advises. Shopping for a growing family can be challenging, but Richards tries to involve her children in the process. Her four-year-old helps cross items off the list as they walk around the grocery store, while her nine-year-old crunches numbers. “[She] struggles a bit with maths in school so I include her in the planning process to help her work out percentages of what we save,” Richards says, noting she’s seen an improvement in her daughter’s math skills. “We try to make it a family thing and I believe it’s important to teach our kids the value of money and teach them to be savvy,” she says. Richards was willing to reveal some tips about how she navigates her usual grocery store for the best deals. First, she hits the clearance shelves to see if she has coupons for any of those products and can stock up for less. “Anything that’s nonperishable would be the best items to go for because if it has a big reduction and/or a coupon then you can stock up!” she says. She notes toothpaste as one item to stock up on when it goes on clearance, since it never really goes bad. If you have a coupon for a product from a particular brand, you might be able to find a discontinued flavor or variety sitting on the clearance shelf. You could even double your savings! And if you’re pressed for time or don’t have the tech to print off coupons before you shop? Your Turn: Share your couponing secrets! Have you ever searched parking lots for extra coupons? Lisa Rowan is a writer, editor and podcaster living in Washington, DC. No matter how many coupons she clips, she always forgets to actually take them to the grocery store.